The size of the bird dictates the size of the cage and its bar spacing and thickness. At a bare minimum, a cage should be large enough for your bird to be able to freely spread both its wings and hop around in the cage. 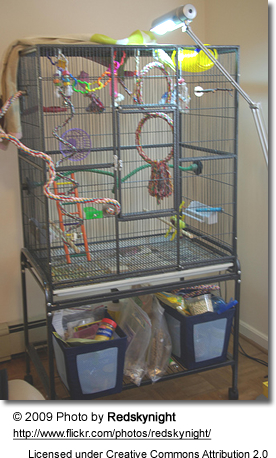 You have to have room for toys and other stuff you add to your bird cage as a way to enhance your bird's environment. As far as cage size is concerned: Larger is better. I am using an amazon cage for my lovebird. Highly active birds, such as finches, canaries, budgies, lovebirds, parrotlets, caiques, etc., require a larger cage than their size would indicate. I looked for the largest cage with 1/2 inch spacing. Most of the larger cages have wider bar spacing (3/4 or 1 3/8 inch), which wouldn't be right for my lovebird. The bar spacing should be smaller than your bird's head to prevent him or her from becoming trapped in the bards. 1 3/16 is a good space for medium birds and 1 3/8 is good for larger. 3/4 inch spacing is fine for cockatiels, smaller than that for finches. Horizontal bars allow birds to climb around the cage. The strength of the bars is important, especially with big parrots. Macaws and cockatoos will easily destroy any cage that can't hold up to their strong beaks. Wire Cages: The most economical and are often used as breeding cages and travel carriers. Most wire cage manufacturers recommend an initial cleaning using vinegar and a wire brush to clean off any production / metal dust. (PLEASE NOTE: HEATED vinegar emits toxic fumes similar to carbon dioxide. Bird owners have lost their pets by adding vinegar to their dishwashing cycle, or used it to clean coffee machines, or when heated in other ways.) Metal poisoning can occur if the metal or metal flakes are ingested; therefore it is important to clean and inspect wire cages regularly looking for broken welds or wires, and metal flakes. Metal Cages: The most popular cages are made from metal. Powdered coated finishes are more resistant to chipping, rust, and are easier to clean than the plated cages. However, the finish can come off over time. Cages with a textured finish are less prone to chip and scratches are less noticeable - also they give a better footing for grasping and climbing. Stainless Cages: The most expensive cage option; however, they will never rust, chip, or cause metal poisoning - and are guaranteed to last a lifetime, which actually makes it the most economical option of all. They are easy to clean and they are strong enough for even the most powerful beaks. Entry doors and feeder doors should have a locking mechanism that will prevent accidental escape. Parrots are very skilled in finding ways to get out. Some birds are real escape artists. In the absence of a good cage locking mechanism, I used Quick Links (the-c-type links) to prevent my parrot from getting out. You may have to use padlocks with larger birds. For the die-hard cases, use combination locks. Removable grids and litter trays are easier to clean than solid cage floors. Removable seed guards help contain the mess to the inside of the cage. Play tops provide a great place for parrots to hang out on. This way you don't have to buy and accommodate a separate play stand. BIrds do need 8 to 10 hours of uninterrupted sleep / rest at night. If your family members stay up late, you may want to consider covering the cage at night. This will allow your parrot to go to sleep and will also stop any squawking at night. In the wintertime, it will also help your pet warm. Seed Guards certainly cut down on the messes. Basic Cleaning: Wash the entire cage and perches weekly (or more often if necessary). I like to take them outside and hose them down with a power sprayer. The stronger the sprayer, the cleaner the cage! Location of Cages: The following information has been provided by Dr. Jill M. Patt, DVM www.littlecrittersvet.com practicing in Mesa, Arizona. - DO place the cage in an area of the house where the bird can see and interact with the family. - DO place the cage in an area with a partial view out a window so that bird can escape from unwanted/frightening views. - DON'T place the cage directly in front of a window, which is subject to dramatic temperature shifts and also doesn't allow the bird to "escape" the view. - DON'T place the cage in a kitchens or bathroom. Kitchens have large variations in temperature and toxins can be inhaled from non-stick cookware and from self-cleaning ovens. If kept in a bathroom the bird is likely to be exposed to aerosolized products that can also be irritating and toxic to their air sacs. - DON'T place the cage in the center of activity for the house. This can result in a stressed and sleep deprived bird. I like to have a night cage in another room. This allows the bird to be placed in the sleep cage at the same time nightly, preventing sleep deprivation. Ideally, the room should be one that is quiet and dark after dusk. An outdoor enclosure for your pet bird does not only offer great environmental stimulation, it is also your bird a safe area to enjoy direct sunlight. Birds use sunlight by preening their feathers with feather dust in the case of cockatiel or cockatoos or the oily secretions of the uropygial (preen) gland. The substance on the feathers will undergo a chemical reaction from the sunlight producing Vitamin D3 which the bird ingests with further preening of the feathers. Full-spectrum lighting is especially important if natural light is not available. Even those by a window will not benefit from the sun because the window acts as a filter preventing the bird from absorbing the benefits of the sun such as Vitamin D3. The exclusively indoor bird does not have the benefit of the reaction. One alternative is to provide full spectrum lighting. Leg weakness and deformities, as well as chick deformities and death, as well as egg binding and soft-shell eggs are common problems associated with vitamin D deficiency. Some of the above information has kindly been provided by Dr. Jill M. Patt, DVM practicing in Mesa, Arizona. She has been keeping and raising exotic birds for years, providing her a unique knowledge and understanding that goes beyond that of a regular vet who does not have the benefit of daily interaction with birds / parrots.